As already stated, in the Morettian method the classification of sentiment as altruistic or egoistic is understood in a psychological not moral sense. This pair of opposites is used not only to attribute a positive value to just one of them, but rather to capture the individual as a whole as well as the dynamic tension. In fact altruism, characterised by the Curved sign, and egoism, characterised by the Angular sign, are actually two opposites that do not allow realisations on principle. «The true Curve, psychologically speaking, does not exist» (44), writes Moretti. It cannot exist, either psychologically or somatically, since even in the greatest altruism the individual «cannot help but conserve what belongs to the inalienability of the same Self» (45). And if not, «man would fall into indolence which is as much physical as moral, forming a selflessness which is unworthy of human dignity and freedom. He would become, humanly, a being without form». (46) In the same way egoism, understood as a form of «care of the Self», also does not allow realisations on principle: there can be no absolute egoist, in the same way that absolute angular writing cannot exist, because this would be a psychological and physical impossibility. The evolution of the individual is determined by both impulses: altruism is necessary for openness, adaptability, the ability to accept, i.e. all the qualities that allow the individual to tap into the qualities of others thanks to the relationship movement; egoism, however, is necessary for the development of individuality seeing as the personality keeps itself distinct from everyone else through actions of personal defence. The process of individualisation develops through the tension exerted by these two opposites: too much altruism is not positive, as it provokes an impersonal adaptability to the environment because the individual yields even with regard to its individual properties: even too much egoism is not positive, since it creates excessive closure and a consequent involution of the system. What appears a logical consequence of this approach is that both poles constitute a necessary limit for the other; when one of the two becomes dominant, the personality suffers an interior imbalance, which is reflected in the outer plane as the inability to effectively utilise both the energy impulses necessary for the creative movement. In fact, the maximum concentration of altruism signs can only result in a personality that is highly deficient in the ability to realise something tangible, visible to the world, even if it be altruism. Moretti presents this occurrence with a series of picturesque, yet effective terms – «placidity and sloth» (47) – that emphasise the surrender movement. In contrast, when the angle enters an accentuation of the movement of closure and personal self-defence it makes the Self extremely active and determined, able to push and stand firm even in the face of obstacles; but in this case the problem is given by the narrowness and rigidity of the goals pursued. Here we can see the predictable effects of excessive identification with only one of the two poles. I am angry because I can’t ever do what I want and others always walk all over me. If I do what I want I feel guilty! Dark side I am tired and exhausted because I always have to do everything, I cannot trust anyone and if I don’t take care of it everything goes down the plughole. First of all I must be good and selfless, otherwise the others will get angry with me, they disapprove of me and I am unable to defend myself, I can only run away. Underlying conviction All the others are spineless and naive, they never get anything done. But you must also beware of types like me who only want to cheat others. In this perspective, the Curved-Angular dyad holds particular importance as it is an indication of the attitudes of sentiment that are the foundations for the activation of the process of individual evolution. The importance given to this distinction was so great that Moretti constructed the whole somatic graphology based on the two fundamental signs, Curved and Angular, in other words the two principal passions of altruism and egoism, specifying how many other graphological signs, while retaining their particular significance, can support the altruistic movement of openness of sentiment or the egoistic movement of closure and protection of the system’s uniqueness (48). And therefore what has been said about the Curved sign is also true for the Angular sign: the exact interpretation of the egoistic movement appears to be the result of two lines of research. The first is aimed at measuring the angularity of the line, while the second involves evaluating the specific contribution given by the all the other signs in the handwriting that can either support the egoistic movement or weaken it by operating in the direction of some other form of openness of sentiment, as we shall see later. Therefore each graphological analysis is based on the accurate understanding of how the Curved-Angular dyad is resolved at the level of the individual. Starting from the basic assumption that no one can live without establishing relationships, in the same way no one can live without in some way bringing her uniqueness into the world. Throughout life the personality experiments different behavioural patterns that allow it to manoeuvre, more or less effectively, when faced with these two large inner impulses that push within the personality in order to be expressed. And each of us – both at individual level and with more gender-specific connotations – develops our own particular behavioural model which remains rather stable over time, so that it falls under the definition of personality trait. Clearly extreme cases become increasingly easier to interpret: when the personality is excessively oriented in favour of the principle of relation, the problem linked to the loss of uniqueness, significance of self follows; when the personality surrenders too much in favour of the principle of individualisation, it begins to misunderstand the importance of boundaries, which become excessively projected in defence of the most material structure, so that the Self ends up inventing a world tailored to itself, in which everything must revolve around it and everything must confirm its point of view. It is obvious that most people are placed in the intermediate band, in which the two movements oriented towards definition and relation are both enhanced. However, to capture the resulting individual movement, which is the objective of graphology, intended as psychology applied to the individual, it is necessary to evaluate the Curved and Angular as both signs and categories. Only in this way is it possible to grasp the uniqueness and complexity of the movement associated with the adaptability, relation, individualisation and definition characterising each personality. A particular understanding of the graphological sign is that which derives from the observation of its distribution across the population, because this allows us to realise in what form and with what intensity the psychological tendency it expresses is realised. In this case, owing to the importance of the two personality traits under consideration, it is interesting to ask: are writings generally more curved or more angular, or do they constitute two evenly distributed groups? Even without statistical data, it seems absolutely clear that as a rule, in our social context, handwriting is more curved than angular; indeed we can say that pointed A Angles and B Angles are an exception compared to an overall softer line. As we know, this does not necessarily imply the dominance of the altruistic sentiment, since the graphologist is able to grasp, alongside the more or less curved line, indicators of defence other than the angle that are implemented by the personality. However, it is possible to say that the prevalence of the curved line appears to indicate the predominance, in humans, of the impulse to socialise, adapt and cooperate and that individuals with an excess of angularity are relatively rarer. Human evolution based on socialising and adaptive impulses therefore appears to have an important individual psychological basis. However, we also know that the impulse to socialise contains a danger within itself, which is that of betraying individuality, its specific aspirations when they are perceived as opposed to the collective Self. The Curved sign, in itself, signifies this: predominance of the adaptive impulse. Thus the realisation that social and socialising tendencies usually predominate in human beings allows us to also understand what may be the implicit danger in this psychological predisposition: the fear of being different from the others, being strange and consequently isolated. It is the danger of conformity, or rather of adhering totally to social expectations and not respecting the process of individualisation. The individual need to do and think like everyone else has been subjected to numerous experiments by various researchers (49), which have confirmed the existence of a stable and lasting disposition in the individual to conform, which manifests itself as the desire to adhere to that stated by others, to act like the others, even if this is contrary to what is suggested by its own subjective experience, which in this way becomes invalidated. If we enter into the dynamic game and the interdependence relationship that develops between the two signs, Curved and Angular, we can moreover understand that if on the one hand extreme Curved writing leads to a conformity that lacks the necessary tension to rebel against any injustices, the few individuals who possess considerable drive towards self-determination and the defence of the Self (excess angularity) are able to impose themselves much more easily, not only thanks to their personal predisposition to activate their resources to the maximum, but also owing to the inability of the majority to oppose them directly and with the necessary strength. In this sense the Angular sign instinctively understands how much and with whom it can abuse its power without, in fact, risking anything at all. The question, however, of the Curved sign’s dominance over the Angular sign appears in a completely different light if it is observed from a historical and sociological perspective. In fact, if we shift our attention to handwriting from past eras and from countries geographically accustomed to harsher material conditions than those normally experienced today in Western Europe, we see that the distribution of the two signs changes significantly. For example, all handwriting belonging to past generations shows a greater diffusion of the Angular sign, and very little distribution of the Curved sign compared to today; therefore the level of angularity considered socially acceptable in the past is not the same as that considered acceptable today. 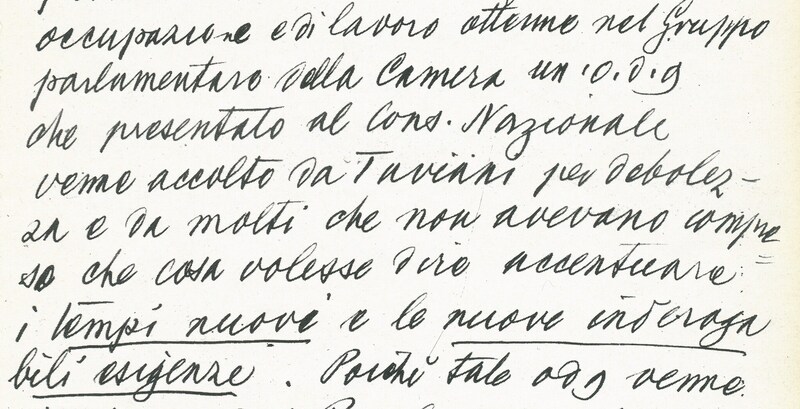 For example, by looking at the handwriting of Alcide de Gasperi, characterised by sharp A and B Angles, it can be deduced that he was the right man to deal with difficult material conditions, ones that require the ability to withstand great sacrifices, through the mobilisation of all the reactivity and tenacity necessary to make the Self strong; however, the same level of angularity today would be considered indicative of the inability to negotiate. Similarly, we cannot but admire the determination that allowed Mary Cassat (1844-1926) to move to Paris to study painting, overcoming enormous family, social and cultural resistance to become what she wanted to be: an Impressionist artist, in other words something that was objectively difficult, and made even more so by the fact that she was a woman and American. What appears just as clearly, at first graphological glance, is the very high level of reactivity and tenacity that the Self has had to implement to make this possible, anchoring the personality to extreme forms of defence. What can be inferred from the comparative study at historical and cultural level is that the level of angularity is certainly a personality trait similar to a reaction formation; the harsher the conditions of life or the obstacles that an individual has to face over its lifetime, the more activated are the basic instinctive defences linked to survival. The same principle can also be applied today: the angular stroke belongs to a personality equipped with great determination and tenacity, but these same characteristics are associated with an aggressive sentiment caused by an overly strict education. In particular, on the graphic level, the presence of widespread angularity (to the extent that it creates stereotypical forms) is interpreted as a response to an invasive event repeated over time: it is a defence that the personality activates independently from any specific stimulus to protect the injured sentiment as a precautionary measure. The behavioural result in this case is given by a preliminary closure of sentiment, which is protected in this way against any movement from the outside, because the personality is no longer able to distinguish neutral or pleasant stimuli from threatening ones. In this sense it must be considered an important warning sign, one involving the need to identify the violations that have been the cause of this total loss of faith in the world. As we have already seen, the A Angle – an indicator of instinctive activation of the egoistic sentiment – suggests that the personality cannot help but enter the field to defend itself and distinguish itself from everyone else, using precise actions. For this reason Moretti identifies in A Angles the sign of competition, which does not depend in any way on the specific abilities of the individual, who can be more or less gifted, but only on the intensity of the impulse towards the distinction of the individual properties that the personality feels within itself and to which it must respond. It is an apparently social movement, since it shifts externally, while in reality it is functional for the defence of Self’s specific qualities. For this reason A Angles belong to individuals who want a career, because they feel the urge to fight and compete; moreover, since they indicate an instinctive reaction against an offence or obstacle, they make the action effortless because the individual just cannot stay still. Conversely, a person with profound, original and even constructive intelligence, but with below average A and B Angles, could ask herself: «Why don’t I feel the impulse to compete, to fight at social level to reach a higher position, even though I have the abilities?». This is why Moretti underlines the existence of other motivations able to activate the Self, such as for example firmness, deliberation and inflexibility, as we shall see below. Therefore, in spite of seemingly irreconcilable differences, given by the fact that the angle leads directly to attacking obstacles and gives the capacity to enforce even itself, while the Curved sign feels an instinctive rejection to the confrontation, that is to say a breaking of the harmony needed to bring the Self forward, this duality is overcome using other behavioural strategies. This basic difference between instinctive activation and pondered activation is particularly evident when looking at handwriting from an historical perspective: while in the nineteenth century angles abounded, and therefore the instinctive activation of reactivity and tenacity constituted a behavioural pattern that was not only widespread, but even necessary for the personality to express itself, in the twentieth century an important psychological transformation occurred, which is still ongoing, in favour of a more pondered activation able to take account of itself but also the point of view of others, with whom it is necessary to know how to relate. This profound difference appears with great clarity by observing, for example, the handwriting of politicians over recent decades: it is very difficult, if not impossible, to find an angularity that exceeds 5/10. 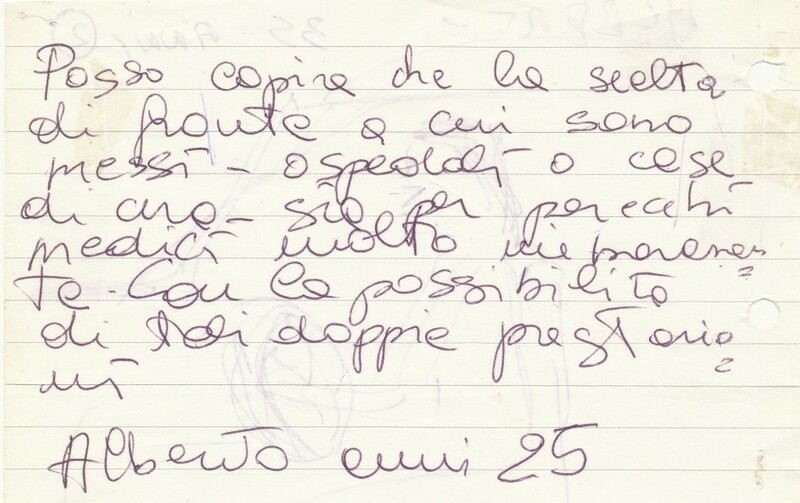 Even the handwriting of a person like Emma Bonino, who became famous precisely because of her breaking actions, is dominated by the Curved sign. The Curved and Angular signs, in addition to the diversity of the instinctive movement of activation, also relate differently with regard to the expectations concerning the action. Conversely, the Angular sign is the realm of those who do not fear comparison because they have the strength to enforce, and if they make practical mistakes it is because they trust too much in themselves; moreover, in its positive and not excessive meaning, it is a defence against the ingenuity of the Curved sign that believes everything is possible merely because it has not actually considered the difficulties. However, since it tends to trust in itself above all, it is easily disposed towards pessimism regarding the motivations of others, in which it sees mainly the negative part; therefore it is filled by feelings of distrust and it is attracted to breaks connected with the dynamics of betrayal. Another basic difference that qualifies the curved and angular movement concerns resilience over time. The Curved sign, as a sign of great openness of sentiment, leads the personality to be attracted to many ideas; but when it comes to applying them, after the initial fervour, it can enter fickleness, or non-action, unless the personality is not supported by other reasons that force it to remain loyal to one particular aspect of its life. Conversely, the Angular sign is rooted in its research, fixing on the argument that interests it personally, and it does not get easily distracted; for this reason it needs the opposite psychic impulse, given by letting go, widening its view, until it understands that other forces, other than those implemented by the Self, operate in its life. All this complexity of meanings revolves around the specific basic instinctive movement that characterises each of the two poles: Curved tends towards instinctive profundity of the altruistic sentiment it embraces through compassion, while Angular is indicative of the equally instinctive reaction of sentiment towards the defence of the Self through movements of attack and resistance.